Only by training the trainers can a sustainable curriculum be created. The USPCAS-W team is building the capacity of educators in Pakistan. In turn, these educators can more effectively train the future water engineers the country needs to address critical water issues. 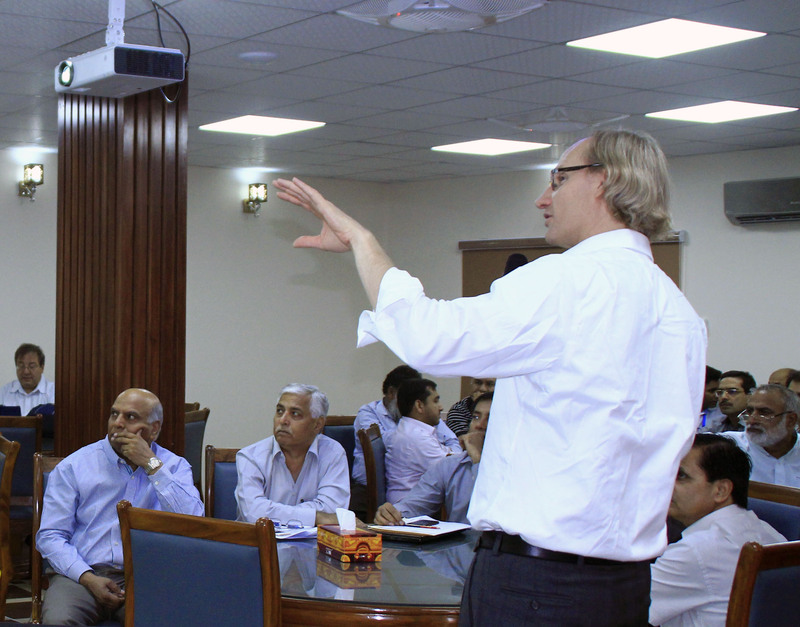 Course Mentoring is a key element of the curriculum advancement program for USPCAS-W. We connect faculty in Pakistan with partners in the U.S. and other countries to improve course content, modernize teaching methodology, and establish best practices. Experiential training topics include research development, research conduct, and effective teaching, among others. This opportunity also generates professional connections that feed the research side of USPCAS-W. Participants learn by doing. Since 2014,USPCAS-W has created four MS programs and three PhD programs at Mehran University of Engineering and Technology (MUET). To date, Over 75 courses have received direct course mentoring and every faculty member at MUET has received both one-on-one training and hands on experience in training workshops. Students in Hydraulics, Irrigation & Drainage come to a better understanding soil, water and plant relationships and how they can be applied to better manage surface and groundwater resources in the production of food. Integrated Water Resource Management students focus on hazard planning and management, water governance, water dispute management, water valuation, and GIS and remote sensing. Our Environmental Engineers apply scientific and engineering principles in dealing with adverse environmental factors, protecting the environment, and improving its quality. Water, Sanitation and Hygiene scholars aquire the skills and knowledge to work with stakeholders to assess, implement, improve, and sustain water and sanitation systems. Faculty consider the qualities that make a good teacher, explore backward instructional design, and define learning objectives. Time is spent exploring Bloom’s taxonomy, assessment techniques, and teacher effectiveness. The training includes opportunities for faculty to demonstrate newly learned skills through hands-on activities. An accelerated program focused on four key areas that support faculty professional development: teaching, student outcomes, experiential learning, and project-based learning. Examples from the semester and faculty experience are incorporated throughout the training. Participants compile best practices for the future. An overview of concepts and ideas for modernizing curriculum. This training is based on examples and synthesis from reports and literature with an emphasis on the UNESCO report on Quality Curriculum. This program is made possible by the support of the United States Government and the American people through the United States Agency for International Development (USAID). The contents are the sole responsibility of the University of Utah and do not necessarily reflect the views of USAID or the United States Government.